Standard - £10.99 Only 4 left! Back in the old days, a bouncing star just meant a few glorious invincibility frames, allowing you to run along spikes and piranha plants and even face Bowser's endless tirade of fireballs without sweating your brow. They weren't common, but you could find them if you knew where to look. It seems that the galaxy figured out how useful they were! Fast forward to the modern era and suddenly those invisibility stars are much less common and, instead, have become objects that are used for all manner of other things from powering space ships to ... being multiple colors? We're not totally clear on the specific differences that the Star has undergone but we do know that it is still the most valuable thing in all of the various worlds connected to the Mushroom Kingdom. Ensure that you have all the tricks up your sleeve with this Nintendo Super Mario Charm Necklace. This 16" chain features a bright Star, Super Mushroom, and Mystery Box to help you have all the power-ups you need to achieve your goals. At the end of your long mission, once you've gathered more Super Stars than you can possibly count and the Princess and Galactic citizens are just about happy, you can feel even greater bliss when you know that you can get that last star with one proud pat on your chest. 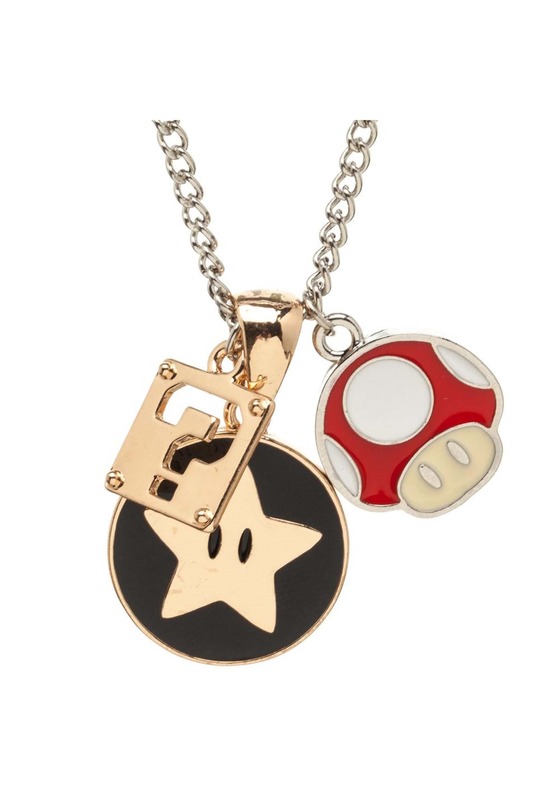 This Super Mario Charm Necklace has all the power-ups you could want... since the Mystery Box can be anything, right?